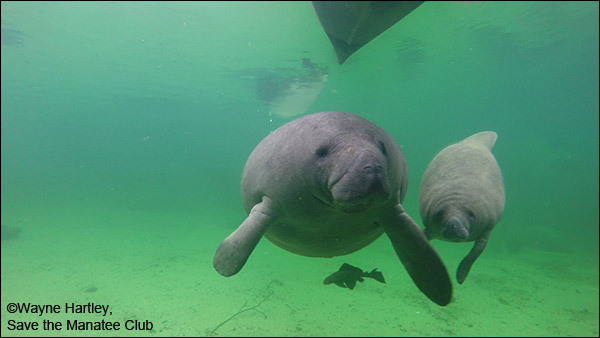 Special thanks to Save the Manatee Club staff members Wayne Hartley, Manatee Specialist, and Cora Berchem, Manatee Researcher, for their work to document the manatees this season and provide us with all the wonderful photos, video, and information. 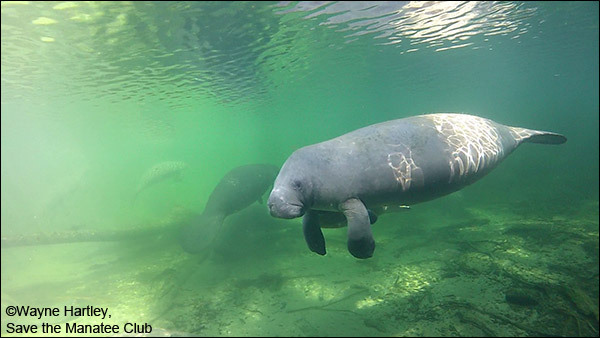 The manatee season at Blue Spring State Park started on October 31, 2018 and ended on March 29, 2018. Above, Nadia and her calf. Cow/calf pairs and juveniles tend to be the first arrivals at Blue Spring, often showing up in October. There were 62 calves at Blue Spring this season. The previous record was 56, set several years ago. 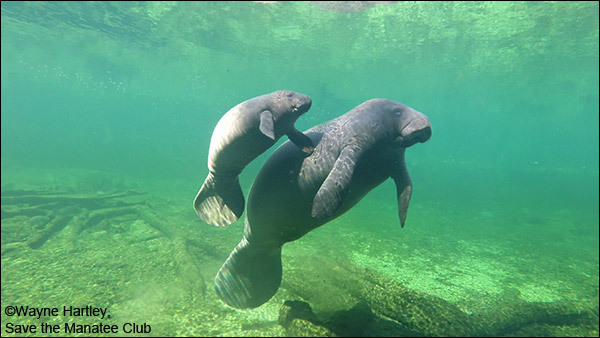 Manatee Schwartzie and her calf in November 2017 at Blue Spring State Park. 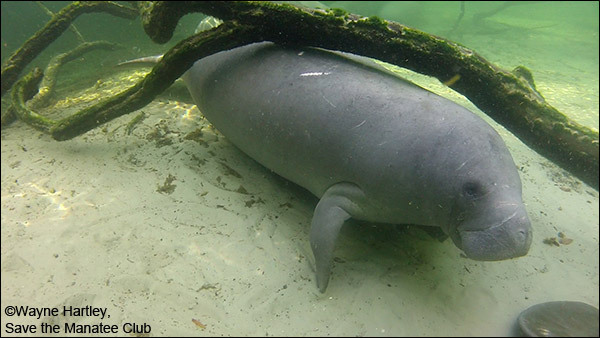 Flo the manatee resting in the warm waters at Blue Spring on December 29, 2018. 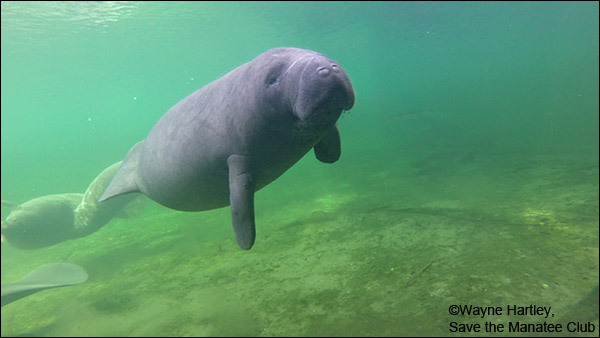 The manatee known as "ProManatee" from the 2017 – 2018 season at Blue Spring. 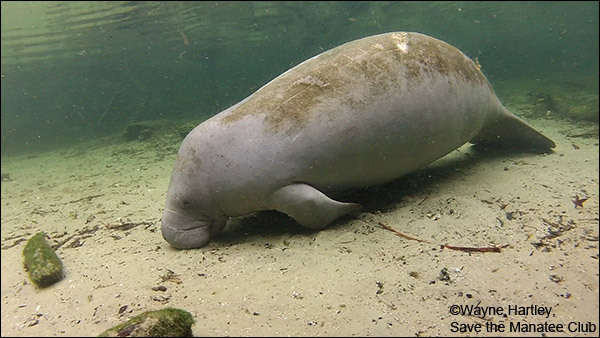 Eris the manatee on December 29, 2017. 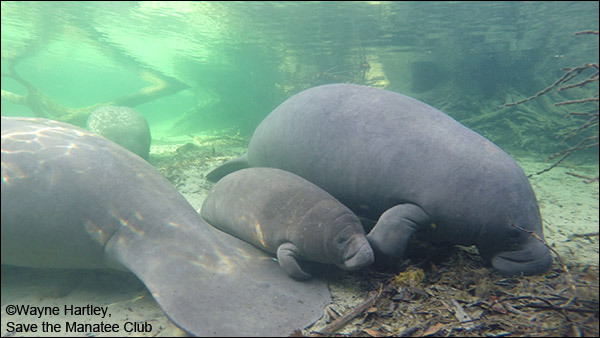 Blue Spring provides a constant water temperature of approximately 72 degrees Fahrenheit, making it a vital winter refuge for manatees. Paula and her calf on December 20, 2017. Adoptee Lucille also came in with a calf. Annie was determined to be pregnant, and Aqua was pregnant when she left for the season. 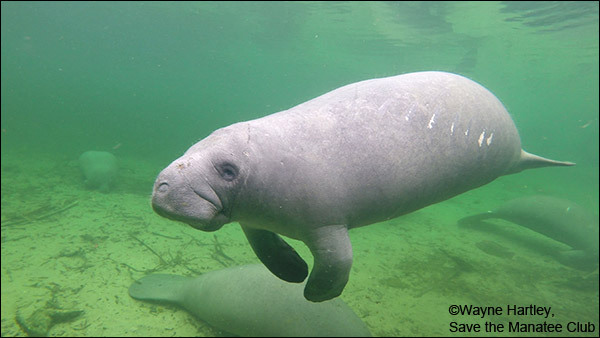 A scarred manatee, likely from a boat hit, on March 13, 2018. "The scar looks bad but is brand new on a young animal and may disappear," said Wayne. 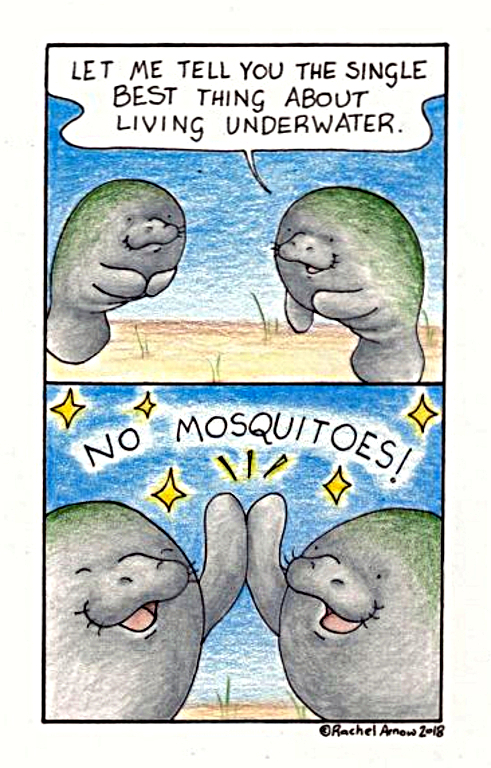 "I will see if the manatee returns next season and will then give the manatee a name and number." 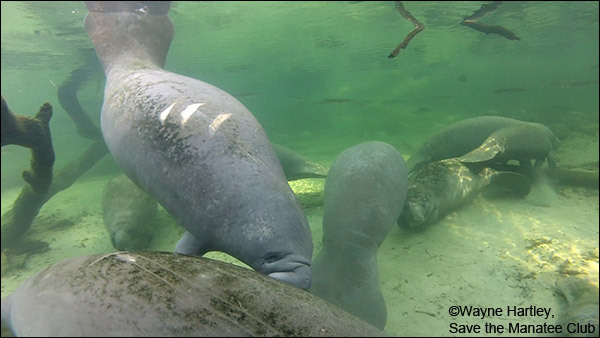 There was a warm spell at Blue Spring for several weeks in February, and manatee visits were sparse. But cooler weather returned again in March, bringing in adoptees Brutus and Rocket, among others. 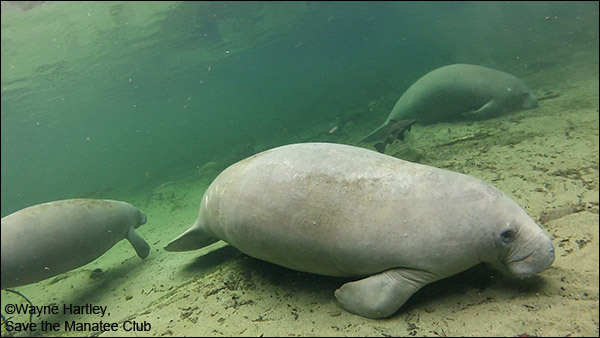 Zana the manatee on March 8, 2018. 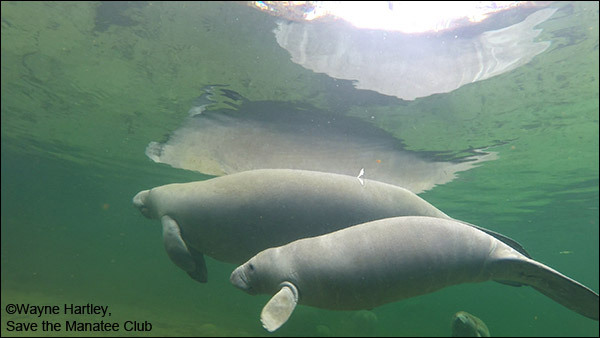 "On the above-water webcam, we’ve seen so many film clips of the manatees playing with an old fallen palm tree," said Wayne. 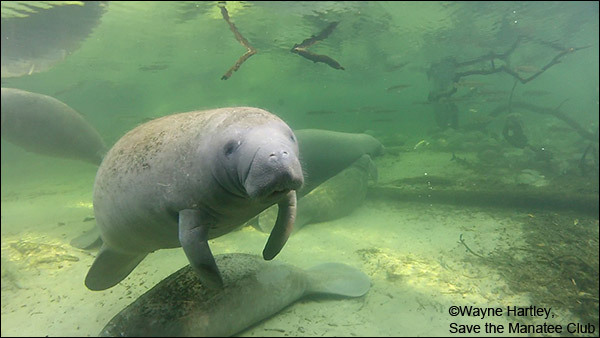 "In January, a fresh tree fell in the same place, and the manatees were enthusiastic."